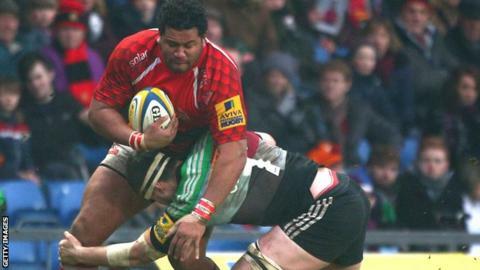 Leicester Tigers have signed a trio of forwards for next season, including London Welsh back rower Opeti Fonua. The 28-year-old Tongan will be joined by Worcester Warriors forward Mike Williams, and flanker Brendon O'Connor, from the Blues in New Zealand. Fonua spent nearly 10 years in France before moving to England this season. Zimbabwe-born Williams, 23, has played 40 games for Warriors in the last two seasons and, like 25-year-old O'Connor, is also English-qualified. O'Connor, who has played Super 15 rugby with the Crusaders and the Blues in Auckland, is a former New Zealand Under-20s cap and World Junior Championship winner. Tigers will be losing England lock Geoff Parling and England Saxons flanker Jamie Gibson at the end of the season.